Many people are suffering silently from chronic foot pain in the hope that it will disappear on its own. People that have experienced shiatsu massage can tell you how effective it is when it comes to getting rid of foot pain. You will wonder why you didn’t know about Shiatsu sooner. The shiatsu massage technique is from Japan and is similar to acupuncture. However, unlike acupuncture that targets the pressure points through needles, Shiatsu utilizes rollers and balls. This explains why many people would rather go for Shiatsu than acupuncture. Of course, it’s the needle factor! The 3Q foot massager is one innovative product that gives you the benefit of shiatsu massage at the comfort of your home. Pain relief for those that wear high heels is one benefit associated with the 3Q foot massager. For the women that love wearing high heels know this pain well. The pain gradually gets worse and is only alleviated through massage and plenty of rest. Don’t wait until it is too late to do something. Treat your feet to a massage every day after work. People suffering from aches and pains in their feet can benefit from this shiatsu massager. This electronic device provides relief from that nagging pain you are struggling with. Unlike the hands-based treatment, the electronic device may be better in several ways. The 3Q massager lasts longer and is convenient. The combination of air pressure, heat, kneading, and mostly Shiatsu soothes and stimulates blood flow in your feet. If you are suffering from particular conditions that affect your feet, then the 3Q foot and calf massager are all you need. The Plantar Fasciitis characterized by the thickening of the sole is among the conditions where the massage will be most useful. This 3Q MG-F18 foot massager with shiatsu, kneading, air pressure massage and heat function has three valuable settings at your disposal. These settings include shiatsu, kneading, and air pressure. Together with the heating function option, the device leads to a soothing sensation and helps you relax. The best thing about this massager is that you can have 3Q MG-F18 manual as well as automatic. You can choose to have a pre-programmed massage, or you can control it by yourself. The degree of compressed air comes in three settings, and the only thing that you need to do is choose the one that suits you best. 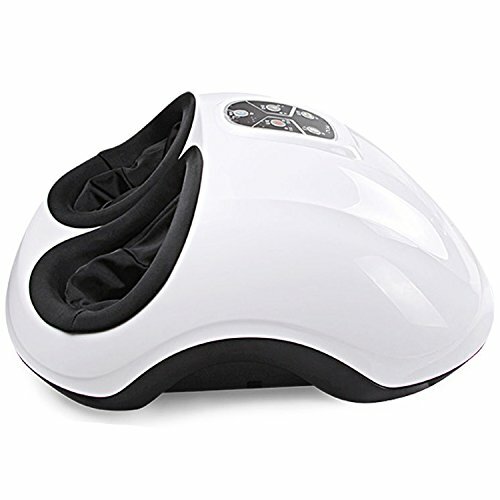 Among the many characteristics making this device one of the best foot massager is its small size. This means that you never have to worry about where you are going to put the device. You can even put it in a bathroom closet or cabinet. The choice is all yours. The massager is also lightweight meaning that you can easily move it between rooms. This means that you can have your massage in your living room, bathroom or even bedroom. The different settings that device comes with ensuring that your massage needs are fulfilled appropriately. Among the product’s highlights is Shiatsu. This feature helps relieve any pain that you might be having. It is also appropriate for those with sensitive feet. Shiatsu helps with circulation thus improving your overall health. The rotating heads providing the kneading massage is one exciting feature for those that use the device for the first time. This feature that has people talking is a source of great relief to pain and provides a high level of relaxation. The air pressure feature separates this massager from the others in the market. The function produces a blast of air from underneath your feet. This creates the pressure necessary for relieving your foot’s muscle tension. The feature turns automatically, but there is a way of adjusting it according to preference. The other selling point of the massager is the heat function. It is often argued that people suffering from foot pain have cold feet. The heat contributes to a soothing sensation that makes you feel as if you can stay there forever. The massager does not get too hot which makes it appropriate for those with sensitive feet. The inside of the massager comes with a cloth cover where you put your feet on. It is easy to remove and wash this cloth cover. This provides an easy way of keeping the device clean and hygienic especially if you are sharing it with others in the household. Of course, it is impossible to enjoy the relaxation and soothing feeling all by yourself. It is a durable product. It will provide you with years of service even under heavy use. The massager is easy to use. You will not need to keep glued to the manual to figure out the controls. You just use the device off the packaging. The massager comes with an auto shut off feature to keep the user safe. Air pressure and kneading are features that will help provide relief to chronic pain. It is lightweight and compact. You can easily move the massager from one place to the other. The product comes with an excellent customer service. Whenever there is something you need confirmation on, the company is more than willing to take the extra step and help you. The massage heads only move in a single direction. This one-sided movement means that the users do not get a chance of experiencing the pleasure of massage heads moving in different directions. Some products in the market offer this feature. Some reviewers have complained that the device does not have a heat adjustment feature. It is too lukewarm for some people that would prefer a little bit of heat to add to the pleasure. This is even when the setting is high. There is no change in heat level. Some of the users with big feet have complained that their heels go untouched. This is a limitation that disadvantages them. When you compare this product with others in the market, it is just right to say that it is one of the most affordable options. You get great features providing the pain relief and relaxation you need. It has valuable controls that help you can use to your advantage. You will not have to keep running to the stores to obtain a new one because it is also long-lasting and durable. It does not matter whether you are suffering from a medical condition causing you pain or just need to relax. The 3Q foot massager fulfills your massage needs conveniently, affordable, and efficiently.